A craftswoman at heart, ever since she can remember, Irene always loves to create things with her hands. The feeling of playing her hands dirty and watching something emerges out of raw materials are what make her heart beats twice as fast. As a girl growing up in concrete jungles all her life, travelling and picking up flower arranging skills have opened her eyes to the beauty offered by mother nature to touch our heart, to heal wounds, and for her personally, to feel closer to the Creator. DIY is her obsession and art supplies are her guilty pleasure. Coffee is her day companion, and bubble tea is her comfort drink. On weekend nights, she is most probably at home watching football match with her husband. Eirene Artisan is her little labour of love to add more beauty to your life’s special occasion. Each drape of silk and shades of hues are wholeheartedly handcrafted and produced out of her humble home in the sunny Singapore. Looking back, her journey in floral artistry has led to her current obsession about natural dyeing. Even though the process is slow and often times long-winded, its philosophy attracts her mind and heart. Besides being more friendly to our planet, the sense of connectedness with mother nature who gives all these beautiful colours always puts her in awe. Truly living colours are their gifts for us. 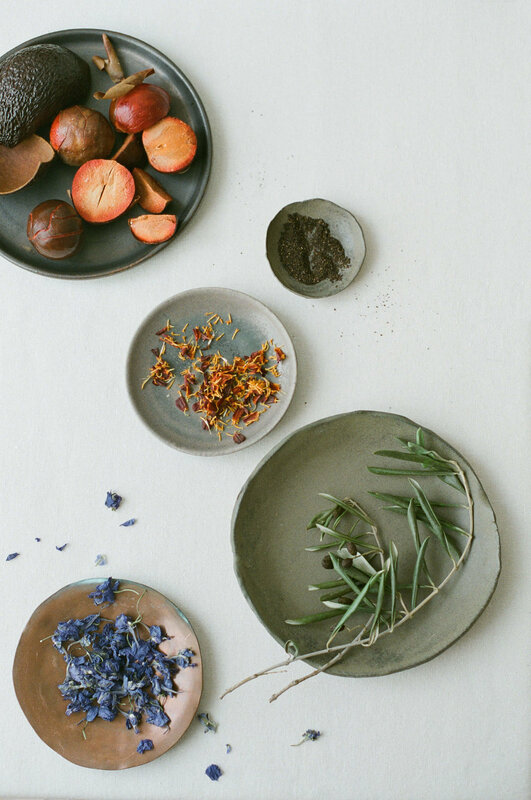 The art of natural dye has taught her about slow living and the virtue of patience. Some plant materials might take days to extract and achieve its richest potential. Nature has its own time for everything; time to sow, time to grow, time to bloom and finally to wither gracefully. She hopes that Eirene Artisan can enrich your life with a touch of hues from nature. Creating beauty that touches souls and speaks to hearts is her deepest desire. Thank you for supporting her works. It means deeply to her and her family. The art of natural dyeing has been around since the ancient times. Before the invention of synthetic colours, people used things from nature to colour their clothes and fabric. The colours produced are subtle yet complex, often times gleaming differently according to the light that casts upon it. To think that what we do has been around since the beginning of civilisations and to be able to preserve this ancient practice is to us a blessed journey to tread on. From one type of flower petals, the colours produced varies depending on the flower species, how they are cultivated, the season when the flowers are harvested, as well as the amount of time spent to extract the colours and simmer the fabric in the dyebath. Hence our ribbon shades might shift between batches, because while we keep a certain recipe in our dyeing process, working with mother nature always invites us to be open to the many beautiful treasures she has got to offer. We believe that this gives the naturally dyed ribbon its unique charm. The process of natural dyeing starts from preparing the fabric to be ready to take up colours, extracting the colours from the roots, leaves, flower petals, bark, and other natural materials, simmering the fabric and soaking them in the dye bath for a few hours up till several days. After that we hand-tear our ribbon, fray the edges, press and finally spool them onto our custom wooden bobbin made of sustainable mango wood. We always strive to produce high quality of craftsmanship, but due to the nature of natural materials and handmade process, our silk ribbons may contain imperfections, such as uneven weave or some colour markings which to us bear the imprints of the hands and hearts of those who make it. Please note that fading is a characteristic of colours on fabric, be it natural and sometimes even synthetic colours. In naturally dyed products, nature gives us living colours, over time the colour might shift or fade. It is recommended to approach this phenomena by embracing the beauty in each of their life phases. Storing the ribbons in a dark place or out of bright light or direct sunlight will help the colour shift happens in a slower pace. Flower stems sometimes curl and leaves grow distorted in the garden. 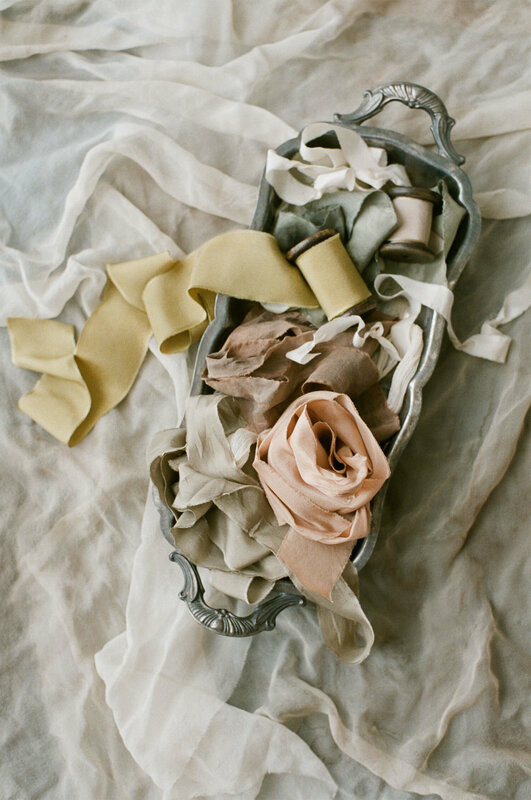 The art of natural dyeing reflects upon the Japanese traditional philosophy called wabi-sabi; which is to accept and find beauty in imperfections. In the slow process of hand dyeing our ribbons, our work becomes a meditation and self reflection of our own fragile lives; broken but meaningfully beautiful.